This version of the song seems almost identical with the one from the Columbia manuscript, A Collection of Dancing Tunes, Marches & Song Tunes. Known as the "Whittier Perkins" manuscript because of the ownership inscription, the volume, in a contemporary leather binding, contains more than two hundred tunes from the American Revolutionary War era, scored for melodic instrument. Many of the melodies are of English origin, but the spirit of the times is reflected in the titles given to the tunes, such as "The Free Born Americans" and "Washinton's [sic] Health." 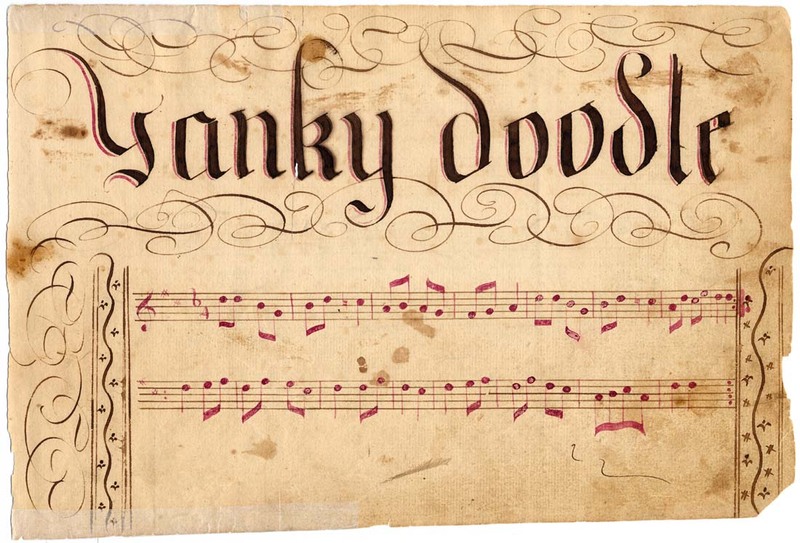 The most famous piece in the collection is "Yankey doodle," which appears here in its earliest known American form. In addition, the manuscript contains such well-known songs as "The 12 days of Christmas" and "Green Sleeves." Our Yankee Doodle is said to have its origins when in 1755, New England troops joining Braddock's forces at Niagara appeared wearing a motley assortment of clothing from buckskins and furs to uniforms that were "some quaint old-fashioned military heirloom of a century past". A British army surgeon named Dr. Richard Schuckburg, recalling the old song ridiculing Cromwell, wrote new words poking fun at the New England troops, changing "Nankey" into "Yankey". It caught on with the Americans, who added more stanzas, and soldiers were said to have whistled it with such 'mocking vim' that Cornwallis supposedly exclaimed, "I hope to God I shall never hear that damned tune again." In the play The Contrast, the Yankee character Jonathan boasts that although he only knows 190 verses of Yankee Doodle, his sister Tabitha can sing them all. The tune was well enough known that in another play, The Disappointment, or The Force of Credulity, written in 1767, one of the tunes is Yankee Doodle. The play is about a then current mania of searching for Blackbeard's buried treasure, and is sung by an old Dutchman, "O! How joyful shall I be, When I get de money. I will bring it all to dee; O! my diddling honey." The tune made good martial music, and in 1768 when British troops arrived in Boston Harbor, Yankee Doodle was said to have been one of the most popular pieces of band music. There are several political songs of the era set to the tune, from Adam's Fall: The Trip to Cambridge; The Recess; The Dance; and "Yankee Doodle, or (as now Christened by the Saints of New England) The Lexington March - N.B. The words to be sung thro the Nose, & in the West Country drawl & dialect." The first verse of the song The Recess (1779) dismally reminds us how little things change: "And now our Senators are gone, To take their leave of London, To mourn how little they have done, How much they have left undone!" The Dance version of 1781 appeared soon after the defeat and capture of Cornwallis, and began: "Cornwallis led a country dance, The like was never seen, sir, Much retrograde and much advance, And all with General Greene, sir." There is a country dance to Yankee Doodle, and Captain George Bush wrote it out in his personal notebook of fiddle tune, copied from a now lost fife tutor printed in 1776 in Philadelphia, the first evidence we have for an American printing before 1794. Otherwise, one of the earliest known printed versions available was in James Aird's "Selections of Scotch, English, Irish and Foreign Airs", published in Glasgow in 1782. All bound around their middles. To see them run such races. And scampered home to mother. And thought that he was larger.